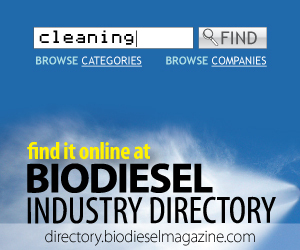 The biodiesel tax credit: gone today, here tomorrow? This article is an attempt to tease out the issues related to value allocation and to look at what impact, if any, the proposed legislation for a biodiesel tax credit extension (S.2021, U.S. Sens. Grassley and Cantwell) has on the price of B100. California is a symptom and an example of a new phenomenon: the fact that climate change, greenhouse gases and massive ice melts, storms and droughts are worldwide events that only an international solution can address. Biofuels offer a solution. At approximately 480.3 million gallons (just under 1.6 million metric tons), the German biodiesel industry set a new export record in 2013, according to an appraisal by AMI based on data from the German Federal Statistical Office. A group of biofuel trade organizations today sent a letter to Senate Finance Committee Chairman Ron Wyden and ranking member Orrin Hatch, encouraging extension of critical advanced biofuel tax incentives, including the biodiesel tax credit. This week fuel additive maker International Fuel Technology Inc. announced that through its U.K.-based sales group Environmental Fuel Technology Inc., another trucking fleet, Tate-Smith Ltd., is now relying on its trademarked DiesoLIFT10 additive. The study involved heterogeneous transesterification using a very active calcium glyceroxide catalyst, followed by efforts to remove the soaps through pretreating the crude biodiesel with sodium carbonate and then ion exchange resin treatment. The heat exchangers in Alfa Laval's new tantalum range are stainless steel heat exchangers that have undergone a unique treatment where a thin layer of tantalum is metallurgically bonded to all surfaces exposed to corrosive media. Maas Companies will auction a surplus 3.2 MMgy biodiesel equipment package April 17 through a timed online auction. Maas Companies says the equipment is surplus to the ongoing operations of FUMPA Biofuels in Minnesota and will sell as one lot.